Our decorations are up, costumes are picked and we finally carved our pumpkins this past weekend. We are ready for Halloween...are you? Every year the kids love to roast the pumpkin seeds...it's such an easy and healthy snack to make. 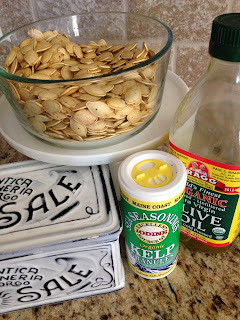 Make sure you clean the seeds really well...it's a little tedious but a must. I spread them out on a cookie sheet and let them dry over night. bake at 300 degrees for 20 minutes. 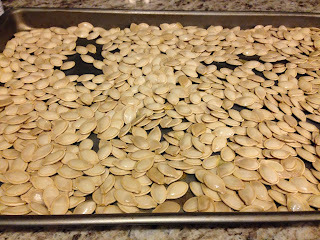 Ohhh I love pumpkin seeds. I like them but never had any luck with making them myself. They always turn out chewy. Hope you had more luck! Karen what do you make for your spooky dinner? Charisa they were good this year!